The Wyse Intel-based 3000 series thin client, which starts at US$429 and is available now, runs on a dual-core Celeron processor based on the Bay Trail architecture. The entry-level thin client offers 3D graphics, said Dan O’Farrell, senior director for product marketing, cloud client computing at Dell. 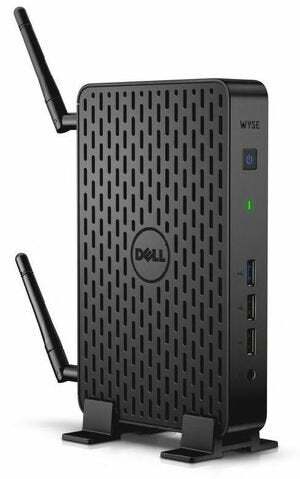 The dual-core Bay Trail chip in the Intel-based thin client “packs enterprise-grade performance,” Dell said in a blog entry. The Wyse Intel-based 3000 series thin client. The Intel-based thin client has Microsoft’s Windows Embedded Standard 7 OS. It can run most virtual desktop or cloud applications, but not high-end multimedia applications that are typically offloaded to workstation-style clients, O’Farrell said. “We’re not targeting it at the high-end power users,” O’Farrell said. Dell’s 3000-series thin clients currently have ARM and Advanced Micro Devices processors, but the Intel chip will represent a significant performance upgrade, O’Farrell said. Bay Trail chips are largely used in tablets, but higher-performing versions have been used in low-cost laptops and desktops. The Intel-based thin client provides four times the application performance and two times the graphics performance of its predecessor, Wyse C-class C90LE7, O’Farrell said.